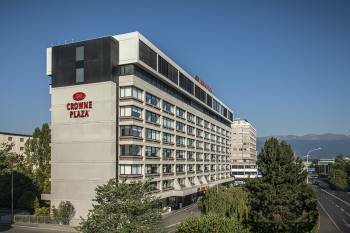 The Crowne Plaza Geneva makes every effort to make you feel at home away from home and welcomes you in a modern and elegant superior 4-star hotel. Our 366 rooms offer a contemporary design and a relaxing atmosphere.Located near the airport and the Palexpo conference and exhibition center, the hotel is ideal to explore Geneva in no time; you will be able to get to the city center in only fifteen minutes. Enjoy the tourist attractions, the walks around the lake, the vibrant streets and luxury shops of the city center! Feel like shopping? Geneva’s biggest commercial center is located a few minutes away from the hotel.Whether you are coming to Geneva on business or to discover the treasures of Calvin’s city, the Crowne Plaza Geneva offers a quality image of Switzerland and welcomes you in a world of elegance, generosity and authenticity.